A beautiful summer apple from Sweden. 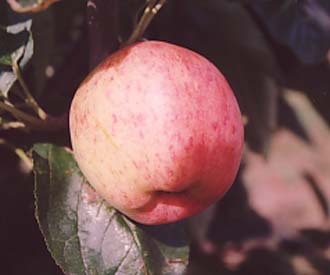 Akero apple is an old variety probably of Swedish origin. It either arose as a seedling at the Akero mansion south of Stockholm or was brought there from Holland c1759. It was first recorded in 1858 by the pomologist Olof Eneroth. Formerly grown in Scandinavia and Northern Germany. Still grown in Sweden. Medium to large, oval fruit. Pink flush over a pale primrose skin. Pale cream, juicy flesh. Refreshing flavour with a savoury tang. Upright, vigorous tree. Very hardy. Good cropper.